September 18, 2012 How Much Privatization of City Services is Best? 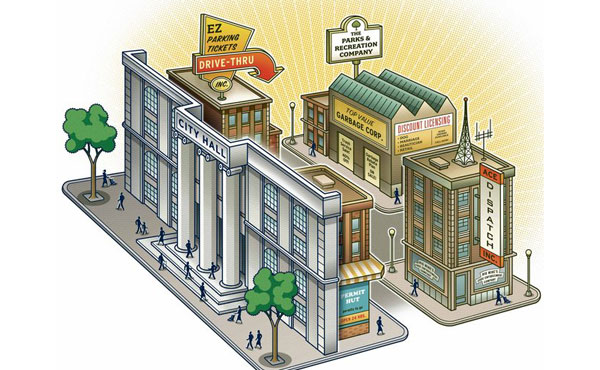 How much privatization is good for cities in this recession-strapped century? Have any cities found it cost\beneficial or cost-efficient to load up on contracts to perform city services? A recent article in the New York Times highlights the experiences of two cities: Sandy Springs, GA and Maywood, CA that have taken privatization to high levels. The second principle of public goods, non-exclusiveness, occurs when you can’t exclude a consumer from receiving the benefits of the system. If the country is under attack by foreigners, then you protect all of the citizens; you can’t exclude people from the benefit. Similarly, it’s difficult, if not impossible to monitor a single car from using the street system in a modern urban city. [ii] If exclusion is possible, such as charging drivers for using a bridge or a toll road with a GPS transponder, then it is good to use the price system for the benefit provided. The conclusion is that if goods or services are non-rival and non-exclusive they ought to be produced in the public sector. Alternatively, if the good or service is rival or excludable then it should be produced by the private sector. A pizza, therefore, is both rival and excludable. If you eat one piece, then I can’t eat it (rival). And if I can separate and charge you a price for your pizza the good is “excludable”. We need to consider these two qualities with each function that a city may decide to contract the service out. In the last round of bidding, Sandy Springs began awarding second and third place bidders in case the primary contractor underperforms. On the negative side, some complain that the new city is a “white-flight suburb that has essentially seceded from Fulton County”. “Will this rich enclave become a gated community walling itself off from areas that are economically distressed?” worries Evan McKenzie, author of “Privatopia: Homeowner Associations and the Rise of Residential Private Government”. [i] Economics of the Public Sector, Joseph E. Stiglitz, 2000, p. 128. [ii] Public Finance, Harvey Rosen and Ted Gayer, 2010, p. 55.